Rachael Ray will be appearing on the Next Food Network Star 2 premiere this Sunday at 9 p.m. on the Food Network to give the contestants a lesson on how to cook in a TV Kitchen. 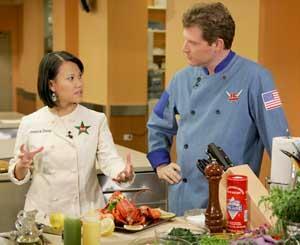 Iron Chefs Mario Batali, Bobby Flay and Masaharu Morimoto will also participate in the premiere. I have not heard good things about the show created by the winners of the first season (I didn't watch that season), but I may try to watch this one. If Rachael is involved, it has to be good, right? The winner gets a six episode show on the Food Network. Screencaps of the premiere are available here.